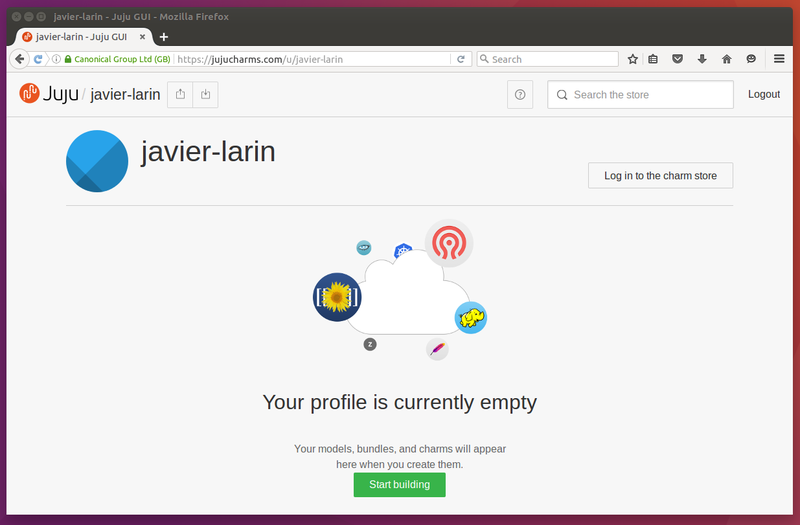 Juju works with public clouds, private clouds, and locally with LXD. A central Juju controller (machine) is used to process all of the events that occur between the Juju client and the workload machines. The instructions on this page will show you how to get started with Juju by using the online hosted Juju controller, the Juju as a Service (JAAS) controller. 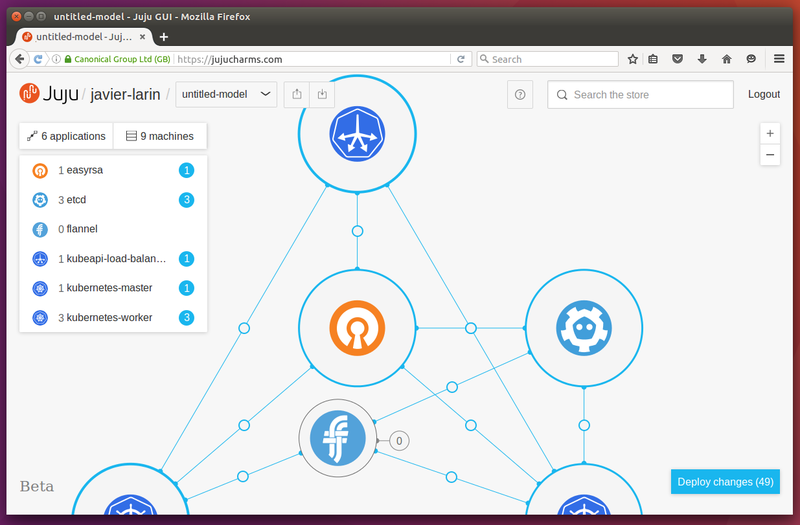 If you'd prefer to test it out locally, see the Using Juju locally (LXD) guide. JAAS supports deploying, configuring, and operating your applications on the three largest public clouds: Amazon Web Services, Google Compute Engine, and Microsoft Azure. All you will need is an account with one of the above clouds, its user credentials, and, for authentication, an Ubuntu Single Sign On (SSO) account. If you don't yet have an Ubuntu SSO account you can sign up for one here (it's easy and free). You can now log in to JAAS. If this is your first time using JAAS you won't have any models yet. Press the 'Start building' button to begin the journey. ... and reveal your (currently empty) model. You build your model by adding and relating applications from the Charm Store. Press the green '+' symbol in the middle of the web UI to search for applications in the Charm Store. You will see a list of available charms and bundles with a description of each. Select a charm or bundle to learn more about it. When you have selected a charm or bundle it can be added to your model by pressing the 'Add to model' button. 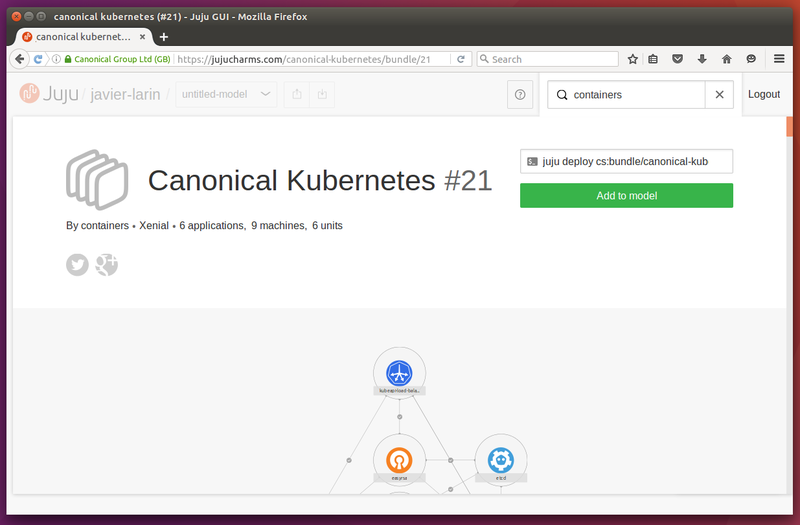 Hint: to see how easy JAAS makes complex deployments, try the Canonical Kubernetes bundle. Press the green 'Add to model' button to select the solution. Press the blue 'Deploy changes' button to proceed. After you press Deploy changes you can adjust your model name and choose a cloud. When you select a cloud, you will be guided through the process of entering credentials for it. We recommend that you generate a new set of credentials exclusively for use with JAAS. Typically, this involves downloading a file from your chosen cloud's web console. Click on Deploy to confirm your cloud information and build your model (and its applications). Deploying takes a few minutes - during this time, instances are being created in the cloud, software is being installed, applications are being related to each other and configuration is being applied. When complete, the application icons will turn grey. As the applications become operational, the colours in the model view will change to grey to indicate an idle state, and the pending notices (amber circles) on the left will disappear to show that everything is working as expected. Tip: You can check and manage existing models through the JAAS web UI by clicking on your username. Juju can also be used from the command line. 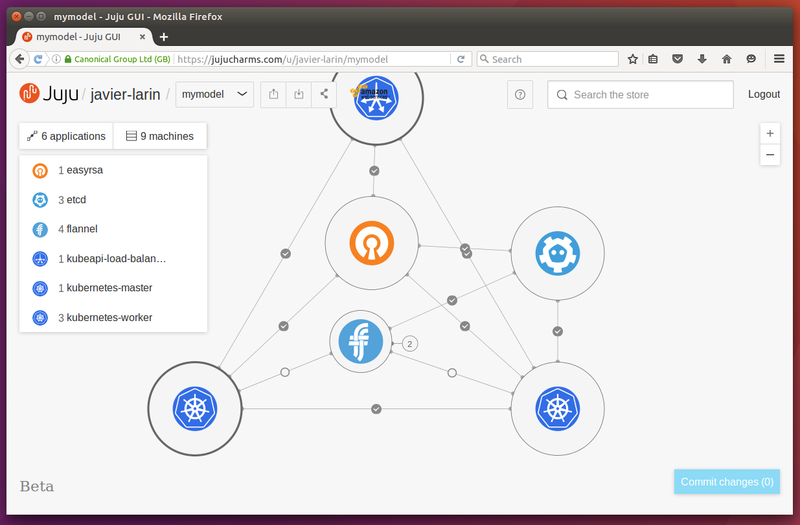 Models you've created with the JAAS website can also be operated via the normal Juju command line. In order to use the command line, you will first need to install the Juju client software on your machine. Juju is available for various types of Linux, macOS, and Windows. Click on the sections below for the relevant instructions or visit the install instructions for a thorough run down of your options. 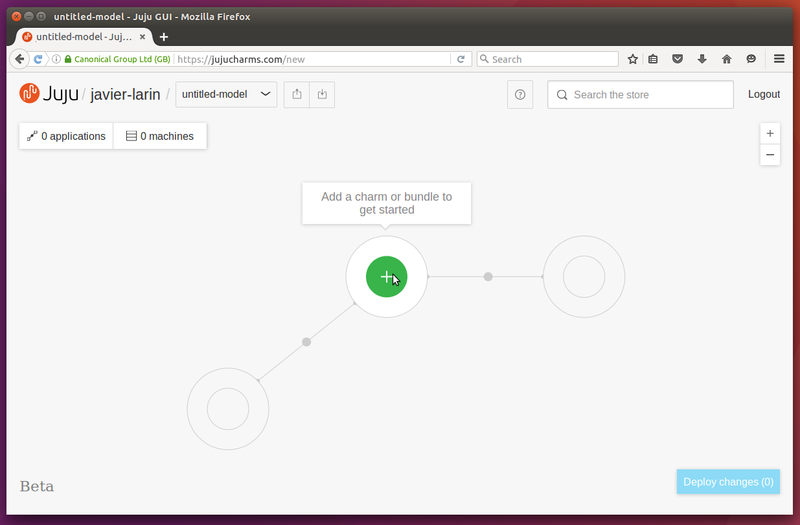 It is possible to install other versions, including beta releases of Juju via a snap package. See the install for more information. A Windows installer is available for Juju. Please see the install docs for other versions. For alternative installation methods, see the install docs. A pre-compiled binary is available for CentOS. Please see the install docs for a link to the latest version. This command will open a new window in your default web browser and use Ubuntu SSO to authorise your account. If the browser doesn't open, you can manually copy and paste the unique authorisation URL from the command output. This process may take a few minutes to complete, as Juju releases the running resources back to the cloud. Congratulations! You have now deployed a complex workload in the cloud without hours of looking up configuration options or wrestling with install scripts!